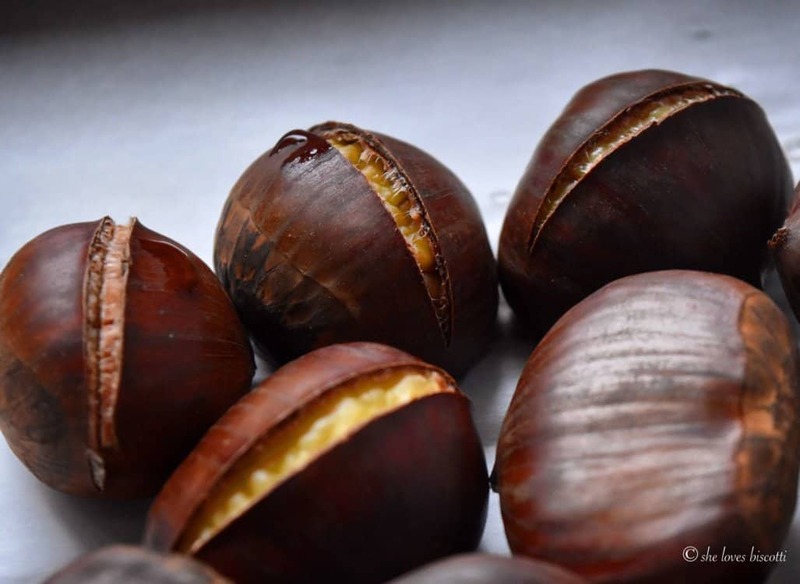 Have you ever wondered how to roast chestnuts? Surprisingly, there is no special equipment required. 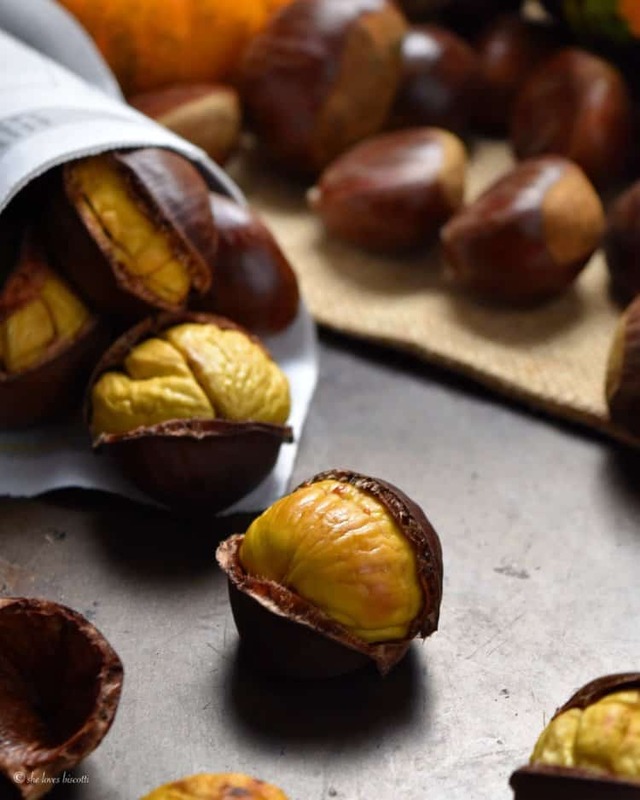 All it takes is 20 minutes and 5 Easy Steps for Oven Roasted Chestnuts. I spotted them last week-end and I felt like a kid in a candy store! The holidays would not be the holidays without them. So, if you have ever asked yourself how to roast chestnuts, I would like to show you my 5 Easy Steps for Oven Roasted Chestnuts. I feel like I should include a disclaimer – as the saying goes, perfection is not of this world. Believe me when I tell you that I have tried all kinds of methods in my “how to roast chestnuts”quest. I have come to the conclusion that no one method is 100% perfect. In other words, what I’m trying to say is that there will always be a few chestnuts that will get stuck to their shell. But despite that, the method I’m about to share with you is the best that I’ve found. 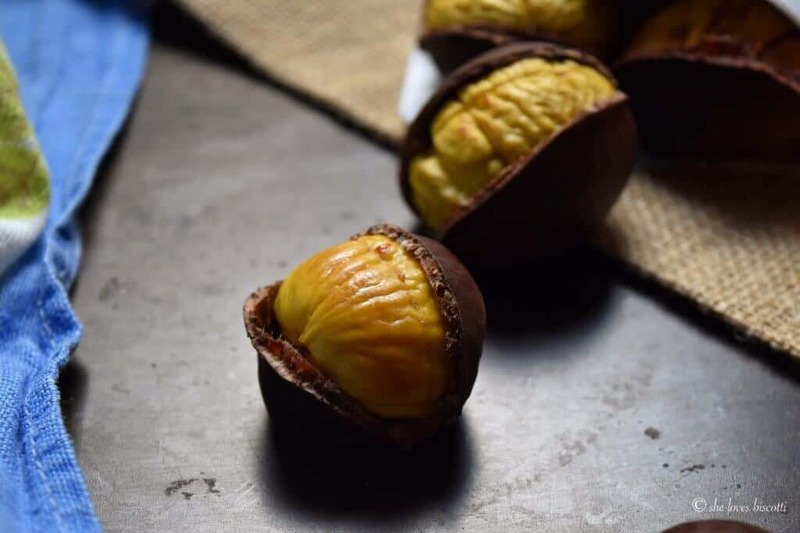 What do I need to make Roasted Chestnuts? Chestnuts! No surprise here. You can use as many chestnuts as you like. Make sure they are firm to the touch. Water. That’s right, our chestnuts are going to get boiled before getting baked. As far as accessories are concerned, you need a cutting board, a sharp serrated knife, a large pot and a baking pan. 1- Preheat oven to 425°: A very hot oven is key for the chestnut to separate from its woodsy skin. Make sure the oven rack is placed in the middle. 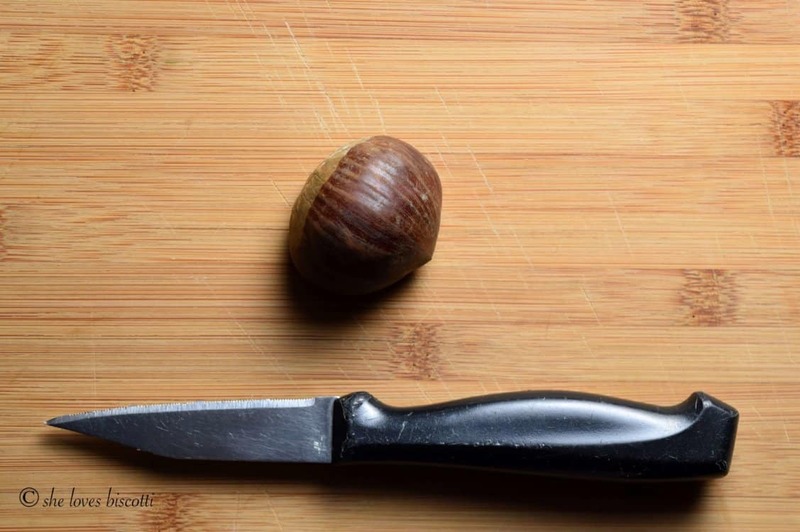 2- Make an incision: Lay the chestnut flat on your cutting board. With a serrated knife, make a lengthwise slit down the entire middle surface, on the long side. Make sure you hold down the chestnut firmly on the cutting board (be careful not to cut yourself as the outer shell is very slippery). 3- Boil the chestnuts: Place the chestnuts in a pot of cold water. As soon as the water begins to boil, remove the chestnuts with a slotted spoon and place on a shallow baking pan. This quick boil will create the perfect environment for steam to be created once they hit the hot oven. 4- Roasting chestnuts in oven: Place the chestnuts with the flat side down, the cut side up in a single layer in your baking pan. Roast in the oven for about 15-20 minutes. This time can vary based on the size of your chestnuts. I will give the pan a few shakes throughout the roasting time. You will notice that the shell splits open as they roast. The only way to know if they are cooked through is by eating one of the roasted chestnuts. 5-Wrap them up: Once you have obtained perfectly oven roasted chestnuts, remove from the oven and wrap them in a clean tea towel. Allow the wrapped chestnuts to sit in the towel for about 10-15 minutes. Your perfectly roasted chestnuts are now ready to be served. Chestnuts are easier to remove from their shell when they are warm. 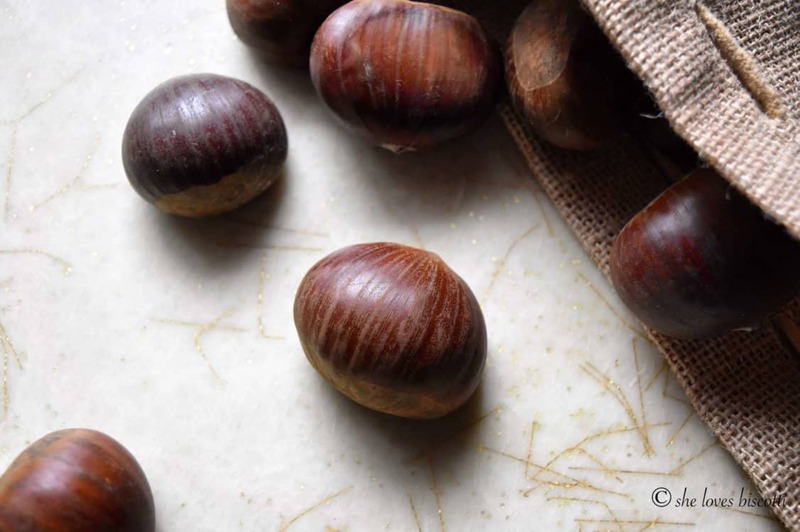 If you have leftover chestnuts, you can peel them and refrigerate them for a day or two. 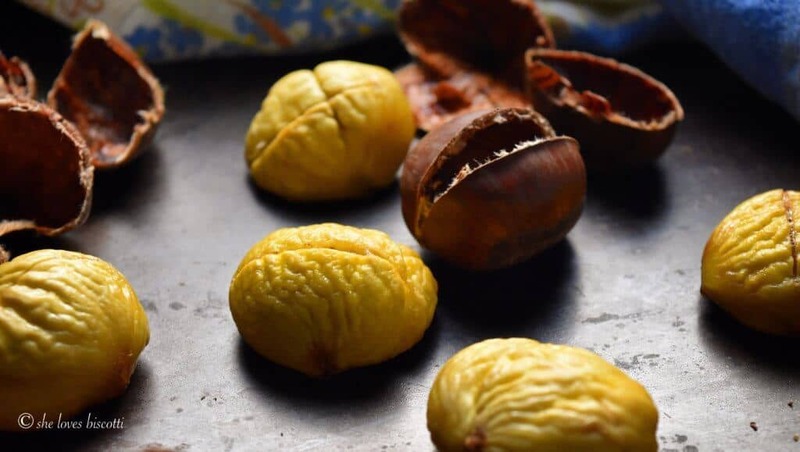 Your peeled chestnuts can also be frozen. feel heavy for their size. Always try to roast your store bought chestnuts within 2-3 days as the freshness will not last very long, even in the fridge. If you uncover moldy or bad chestnuts, they need to be discarded. Unfortunately, this can only be discovered once they are roasted and removed from the shell. 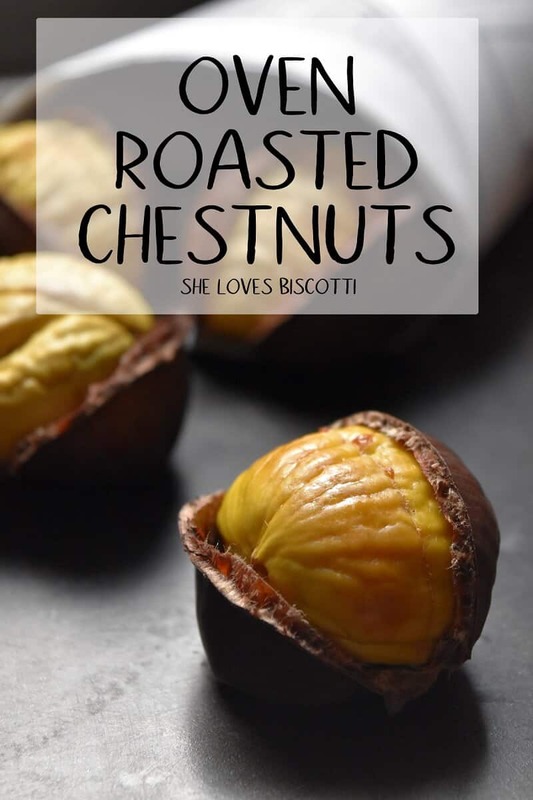 Looking back, I think my whole family was obsessed with how to roast Italian chestnuts. I remember my Mom trying to grow chestnut trees. She successfully started a few from seed. The trees had a couple of good, chestnut-full years, but unfortunately the chestnuts would fall before they had a chance to completely ripen. More often than not, the store bought chestnuts were roasted –oven or fire roasted. My parents had all the gadgets and the pots and the pans to make the best roasted chestnuts. Sometimes, my mom would just boil them and we would have them as after school snacks. Did you know that they make absolutely wonderful desserts once they are pureed? Have you ever had chocolate and chestnuts together? Italians desserts from the South are notorious for stuffing these gems in pastry dough. Of course, chestnuts can just as easily be prepared in savory dishes. Did someone say stuffing? I adapted this method on how to roast chestnuts from Chef John Mitzewich. Chef John uses no fancy gadgets or knives. Just a serrated knife, a pot and a simple roasting pan. Thanks Chef John! 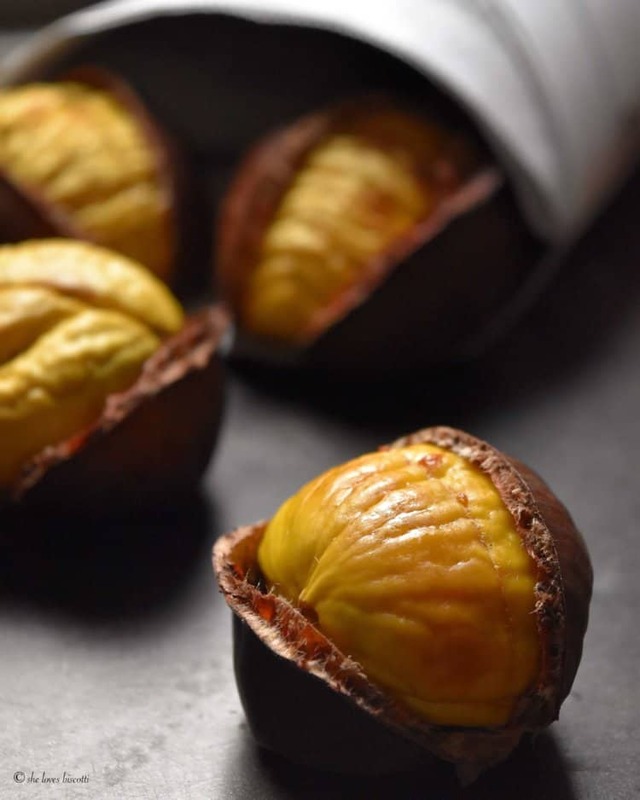 The holidays would not be the holidays without chestnuts. I know they’ll be part of my Thanksgiving meal. 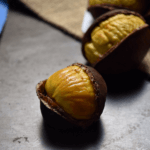 Just 5 Easy Steps for Oven Roasted Chestnuts and they can also be part of your Thanksgiving. Thanks for allowing me the possibility to share some of my favorite recipes with all of you. 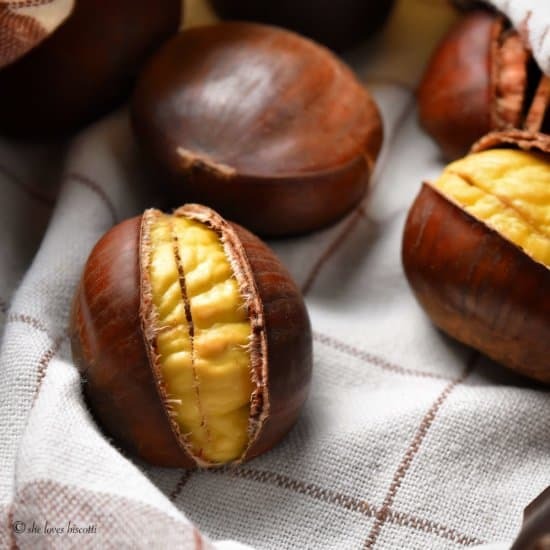 ★★★★★ If you have used this method to roast chestnuts, I would love to hear about it in the comments below and be sure to rate the recipe! 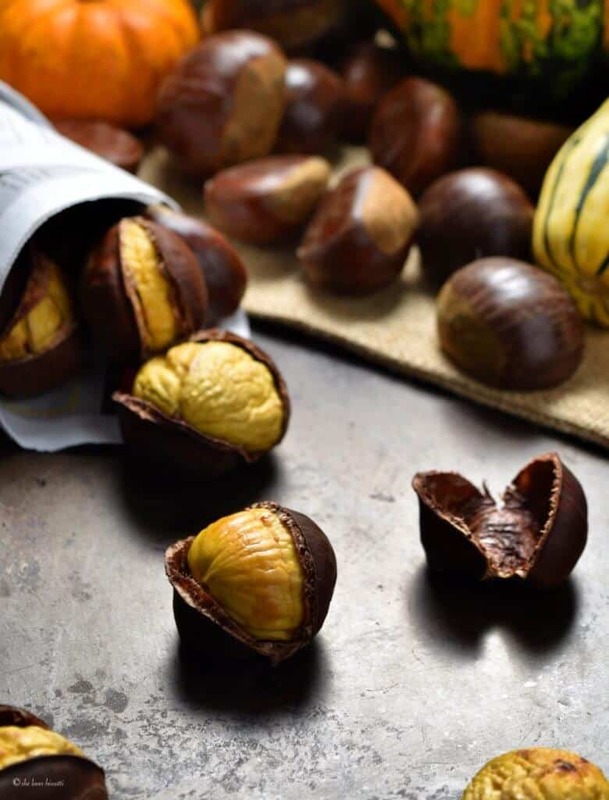 The holidays would not be the holidays without chestnuts. All it takes is 20 minutes and 5 easy steps for oven roasted chestnuts. Preheat oven to 425°: Place oven rack in the middle. Make an incision by laying the chestnut flat on your cutting board. With a serrated knife, make a lengthwise slit down the entire middle surface, on the long side. Make sure you hold down the chestnut firmly on the cutting board (be careful not to cut yourself as the outer shell is very slippery). Place the chestnuts in a pot of cold water. 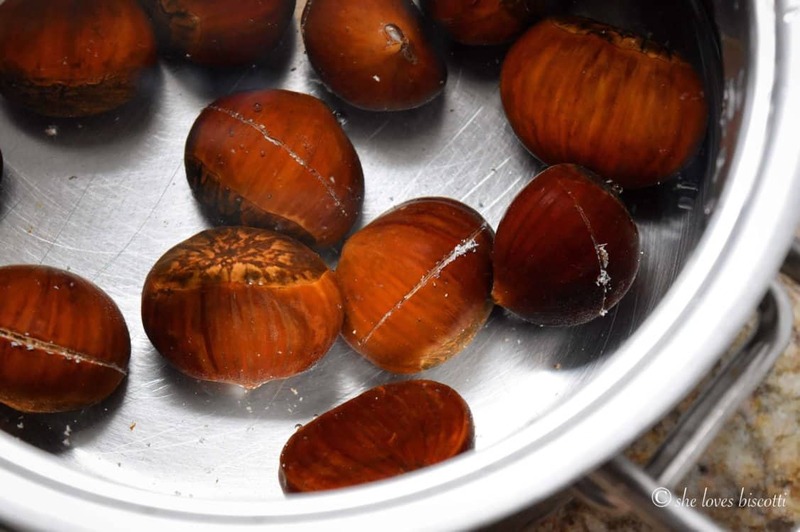 As soon as the water begins to boil, remove the chestnuts with a slotted spoon and place on a shallow baking pan. Place the chestnuts with the flat side down, the cut side up in a single layer in your baking pan. Roast in the oven for about 15-20 minutes. Once you have obtained perfectly oven roasted chestnuts, remove from the oven and wrap them in a clean tea towel. Allow the wrapped chestnuts to sit in the towel for about 10-15 minutes. You can roast as many chestnuts as you like. I have just read your recipe it sounds perfect! I got so excited that I want to thank you in advance… am going to try it today. My pleasure Ghazala. Thanks so much for taking the time to comment. 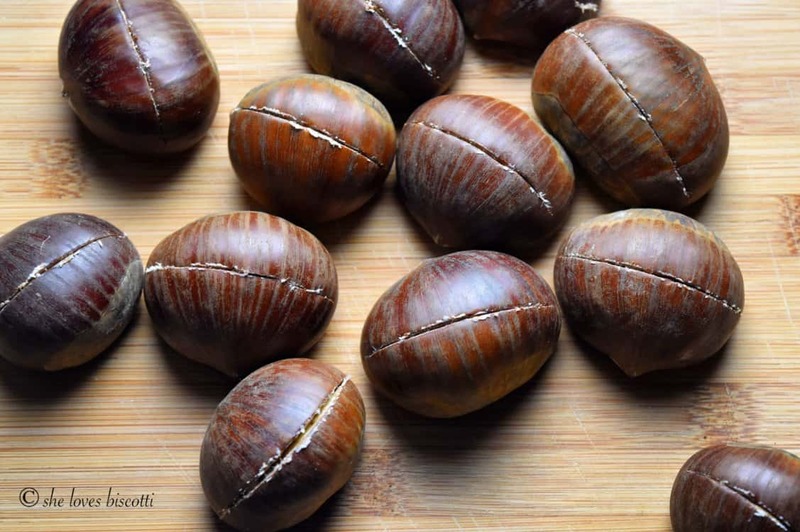 Is it possible to use a microwave for cooking chestnuts ? We have a pepper roster we use at the growers market.How do you think chestnuts would hold up? Would love to try for winter markets. Always bought roasted chestnuts on the streets. This is the first time I have ever tried making it on my own and it came out PERFECT!!! You are awesome! Thank you sooo much!! Hello, I just purchased a bag of frozen, shelled chestnuts at the market in Portugal. How would I roast these? Worked a treat for me! I picked a lot the other day and they were big nuts from very old trees here in south east England. The boiling first and then roasting really helped-never had so many peel so easily! Thank you! I made some today and they are yummy. Thanks for your instructions. It was very easy to take the chestnut out of the shells. I love chestnuts. Thank you! Thanks for posting this. I was following a very similar Youtube video of the same method for years but it suddenly disappeared. Thank you for preserving the single-cut, boiling and roasting method! BTW, you should show a pic of a knife with a serrated edge, not a paring knife. My pleasure Craig! It really is one of the best methods! Yes, you are absolutely right lol! The funny thing about this paring knife is that it has little “teeth” and I have no difficulty cutting through the outer skin of the chestnut. But I realize that this is an old, old knife and definitely not a serrated one at that. Will update with new pictures when I have a chance. Great comment, thanks again! Never had chestnuts before. Work friend gave me about a dozen and said to try them and if I liked them (and the work involved) many more would come my way. She has a coup,e of trees. I followed your simple instructions and recipe and they turned out fantastic. Tasted delicious too. Thanks for the easy to follow instructions!